size: [Choose]Small Pony (18")Foal (16")Weanling (18")Small (20" ponies/yearlings)Miniature Horse 16"Miniature Horse 14"
This set is specially for children and is made with a shorter training line, making it less bulky for small hands. The carrot stick is in a shorter 3ft length and is now black in colour, with black English leather loop hand wound with waxed twine. (see separate photo of stick) You have a choice of 3 lengths for the savvy string in the drop down menu. Natural rope halter in sizes up to and including pony size. 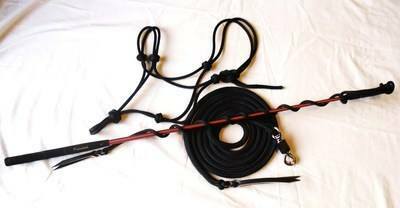 10ft Training line in a 13mm diameter with a special lighter weight chrome plated zinc barrel swivel clip. This clip is very easy for small hands to operate. The lighter weight helps ensure that the pony doesn`t get quite such a hard whack under the jaw if the child handler gets a little exhuberant with the training line! Savvy string in length of your choice. A shorter length 3ft Communication/carrot stick especially for children. There is a choice of the traditional weight stick or the ultra lightweight stick. Please note that due to the length of the carrot stick this item can only be sent by courier service with a 3 to 5 day delivery time.